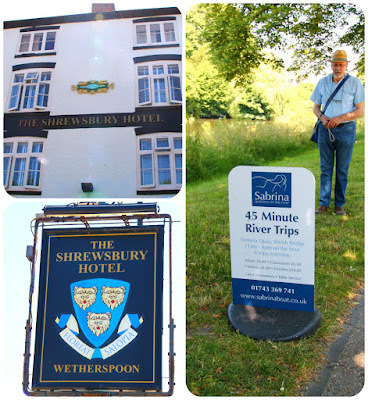 Near the end of our first holiday week, the weather was on its best behaviour, so on Friday, we were ready for a visit to Shrewsbury, the only town of any significance in this most rural of counties. Shrewsbury is Shropshire's county town and it was founded by the Saxons and extensively developed by Tudors. It really has it all: a river, a castle, spires, an abbey and lots of half-timbered medieval houses. 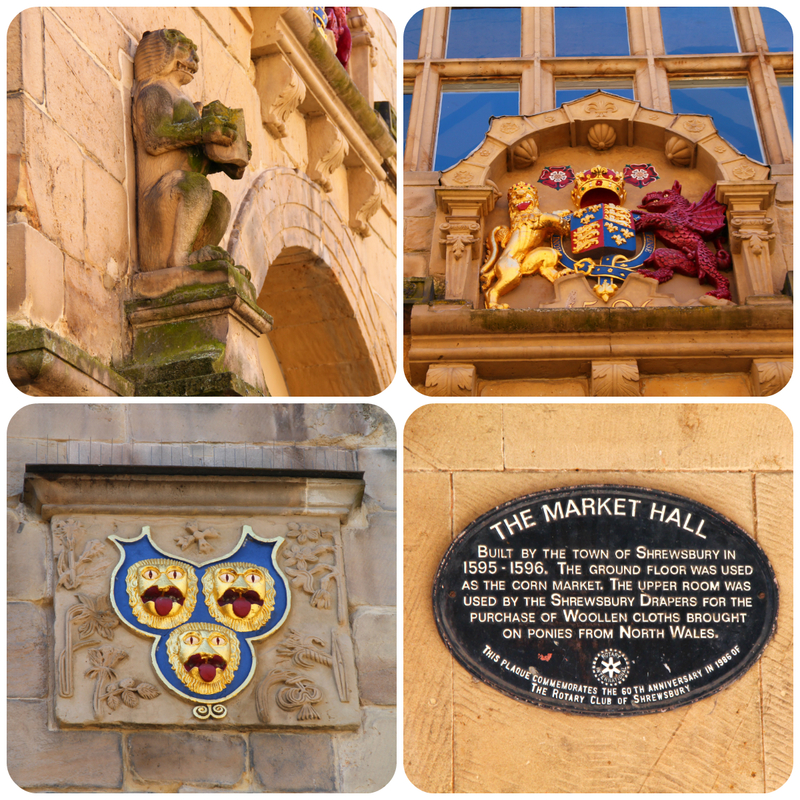 In fact it boasts over 600 listed buildings! What's more, it quite magically lies within a giant loop of the river Severn. 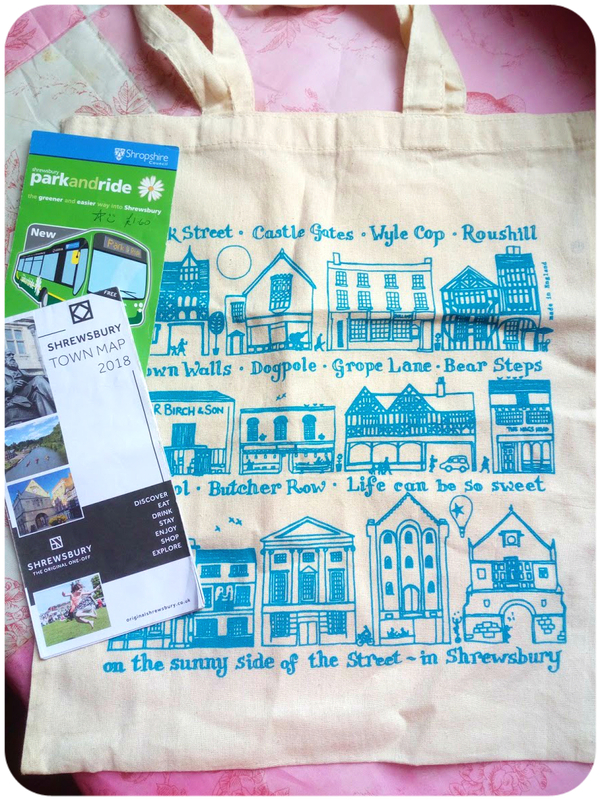 Among the many leaflets and brochures in our cottage, there was one advertising the town's Park & Ride service, so that was our parking problem sorted. The nearest of Shrewsbury's Park & Ride locations was a drive of just over half an hour on quiet country lanes, including a long, single track one aptly named Long Lane! After reaching the main road and negotiating an awkward roundabout, we finally made it to the car park, where the bus was just leaving, so that unfortunately we had a twenty-minute wait. The leaflet mentioned that it was £ 1,60 per person, but the driver declared that we were a small group, and only had to pay £ 2,50 for the both of us! 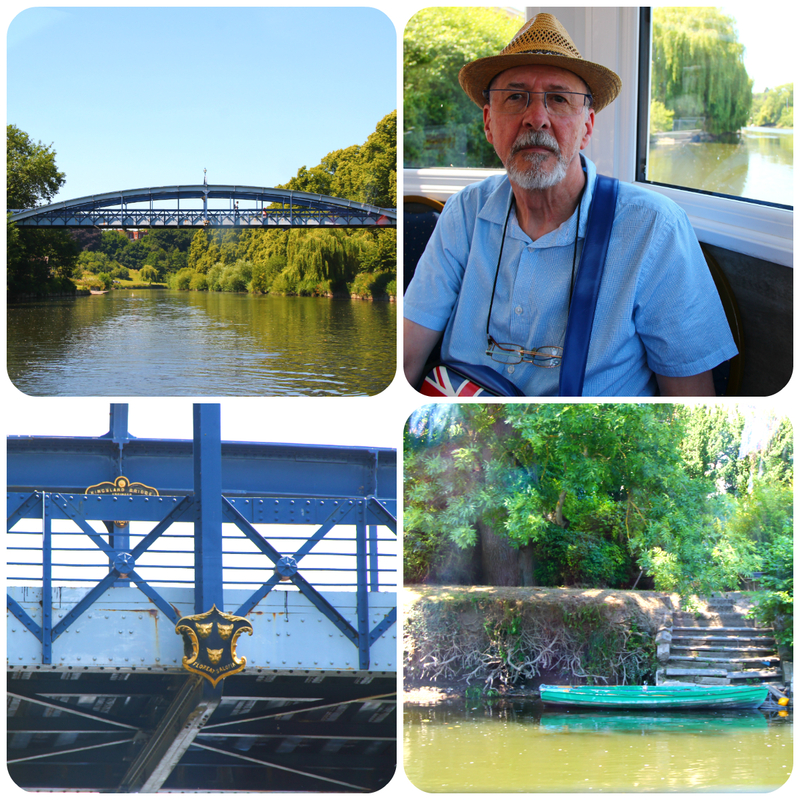 The bus crossed the English Bridge, one of the town's main bridges, expertly negotiated the town's narrow streets and dropped us off at the Square, from which we made our way to the tourist information centre to pick up some more leaflets, including a town trail. Standing tall in the Square is a statue of Robert Clive, also known as Clive of India, who later became MP for Shrewsbury and then Mayor in 1762. Our next quest was getting two leftover £ 10 notes exchanged, which had become obsolete since our last visit, so we hopped into the nearest bank. Unwilling to help us since we didn't have an account with them, they directed us to the post office. Following directions and trying to get our bearings at the same time, we eventually reached the post office, which was situated in the basement of a well known bookshop. But the journey had been a futile one, as here too they refused to exchange the notes. Giving it one more attempt, we went into the bank immediately opposite, where a kind lady took pity on our plight and gave us two shiny new £ 10 notes. Result! 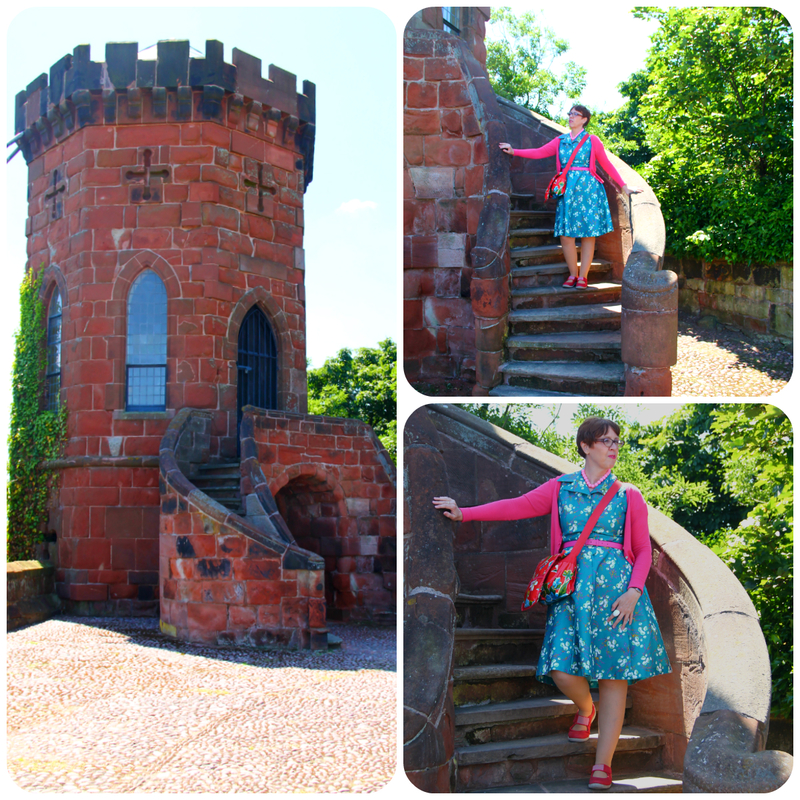 As we were now at the other end of Shrewsbury, near the castle, we decided to investigate and, following an uphill path and some steps, we emerged onto a cobbled area, a romantic little tower, built from the same red sandstone as the castle itself, in its right hand corner. The tower was built by Thomas Telford in around 1790 on the castle motte for Laura, the daughter of Sir William Pulteney as a summer house, and rather unimaginatively named Laura's Tower. Across the road is Shrewbury's library, formerly Shrewsbury School, where Charles Darwin, the town's most famous son, was a pupil between 1818 and 1825. Darwin's statue has been standing in front of the library since 1894. 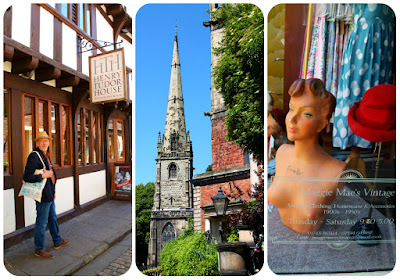 The castle itself houses the Shropshire Regimental Museum, but as this isn't our cup of tea, we retraced our steps and followed our noses through the steep narrow streets and alleyways of this utterly captivating town, abandoning any itinerary we had in mind. Well, we were in good company then! Then there are Shrewsbury's Shuts and Passages: a unique maze of narrow alleys which criss-cross the town centre and are part of the town's medieval street plan. The spire of St Mary's is one of the tallest in England. 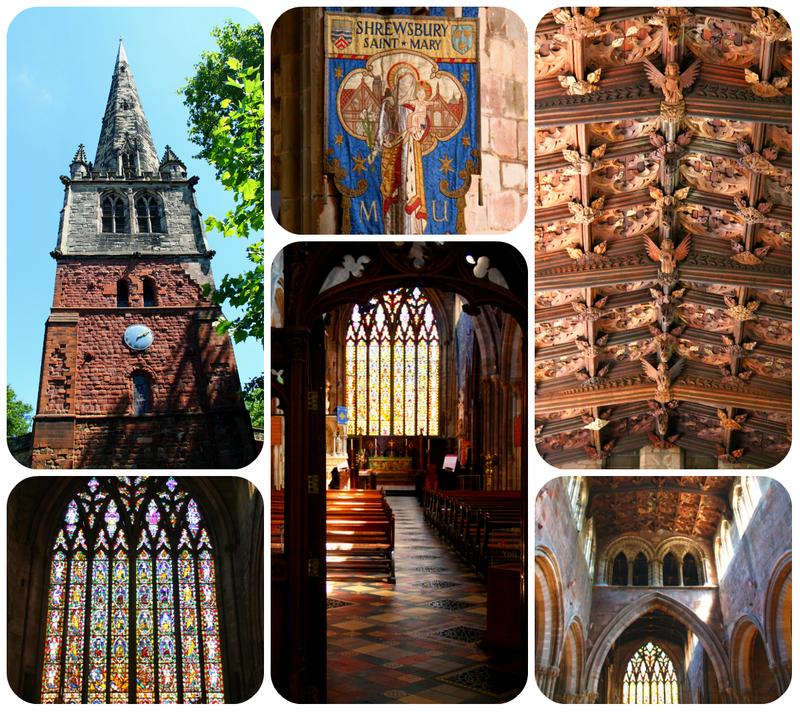 It dates from Saxon times, with additions from the 12th Century onward. 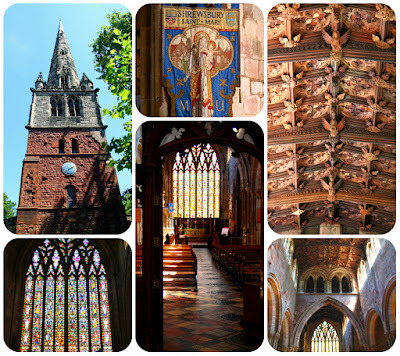 Inside, the atmosphere is peaceful, with soaring stone arches and glorious stained glass, including the famous 14th Century Jesse window. Lifting one's eyes upwards, the wonderful 15th Century carved oak ceiling of the nave, with a profusion of animals, birds and angels, can be admired. After a restorative cup of coffee, we walked into the direction of The Quarry, once a stone quarry, but now a 29-acre parkland lying between the town centre and the river. Claremont Hill, with its steep incline, should have brought us to the park's main entrance. 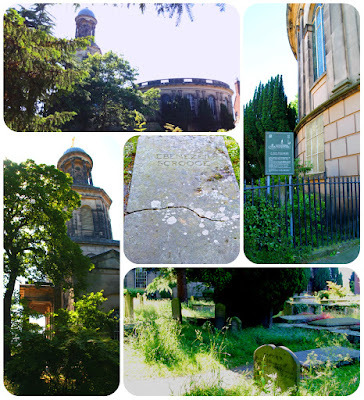 On our left, and facing The Quarry, St. Chad's Church's, with its distinctive round shape and tower, appeared, and we entered its leafy churchyard. The church dates from 1792, and was designed by George Stuart, who also designed nearby Attingham Park, which we would be visiting later. Charles Darwin was christened here in 1809. In the church yard lies a mysterious gravestone, bearing the name Ebenezer Scrooge - this is a prop left over from the filming of "A Christmas Carol" in 1983. It was late afternoon by then, and our feet were starting to kill us. As it was clear that we hadn't even scratched the surface of all that Shrewsbury had to offer, we decided to return the next week. The Quarry and the river would have to wait! And so it was that on Tuesday of our second week, we made a return visit. The temperature had climbed to the high twenties by then, and a boat trip seemed to be an excellent idea. Named after the water nymph who supposedly guards the River Severn, the riverboat Sabrina travels along the river loop, from the Welsh Bridge to the English Bridge and back again. "High the vanes of Shrewsbury gleam, Islanded in Severn Stream"! I've had a treasured copy of "A Shropshire Lad", a cycle of sixty-three poems first published in 1896, for years, and find it utterly moving. 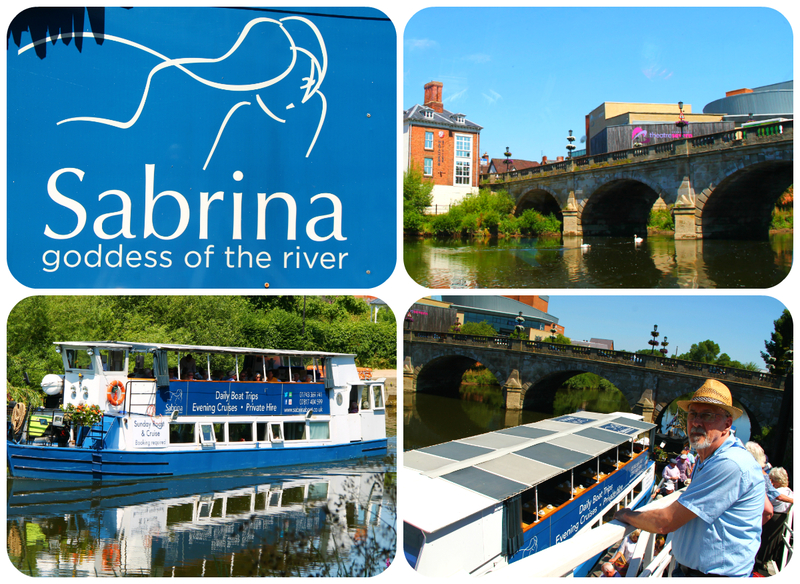 The Sabrina is cruising the loop six times a day, on the hour, so we decided to have an early lunch, and try and catch the one o'clock sailing. There was a Wetherspoon's nearby (in fact, there were two, but we opted for the Shrewsbury Hotel over the modern Montgomery Tower branch), so that there was no competition, really. After lunch, we sauntered towards the landing stage, and almost saw our plans thwarted as there was a huge queue. Apparently, they were a group who'd booked in advance but, as long as we didn't mind sitting in the back of the boat, we were welcome to come on board. We cruised at a leisurely pace towards the English Bridge, at the other side of the loop, where we turned around. 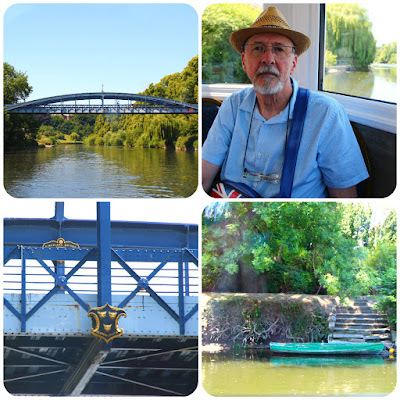 On the way back to the Welsh Bridge, we were regaled with historic details and anecdotes by the Sabrina's skipper, whom I suspect is dabbling in amateur dramatics, as well as being a budding comedy genius. 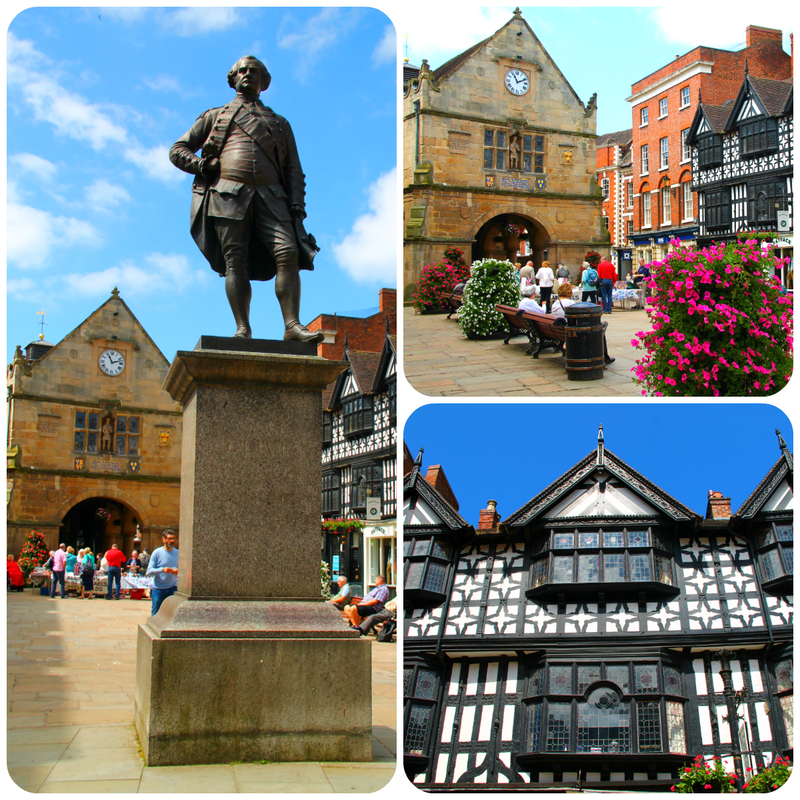 One of the intriguing facts we learned was the origin of the name Shrewsbury and, by extension, Shropshire. 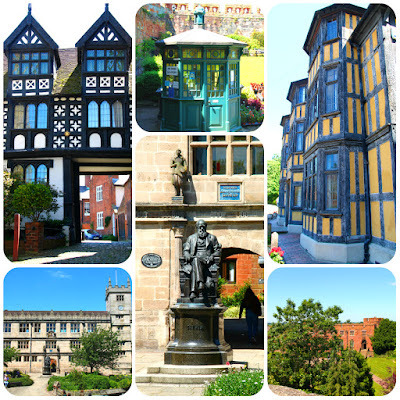 Shrewsbury began life as Scrobbesbyrig and Scrobbesburh in Old English, which has several meanings including "fort in the scrub-land region". This then mutated into Sloppesberie, which became Salop or Salopia (an alternative name for both town and county), and into Schrosberie, which eventually became the town's name, Shrewsbury. 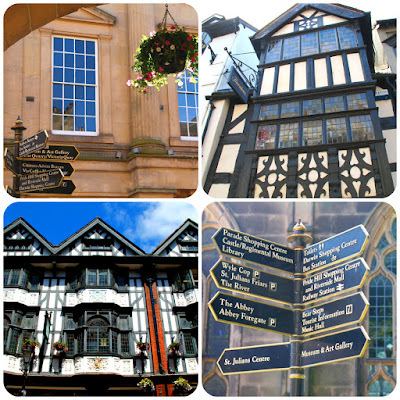 Although Shropshire residents are still referred to as "Salopians", Salop however is also used as an alternative name for Shrewsbury, with which it also shares its motto of Floreat Salopia. And even though Salop immediately put us in mind of the pejorative French word salope, we weren't about to point this out to any Salopians! 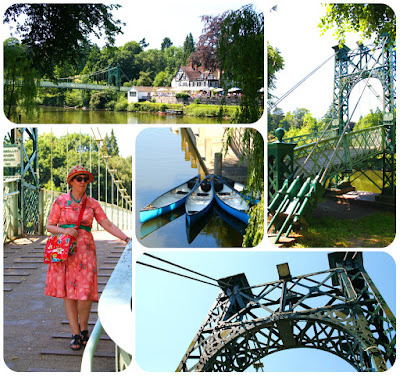 Back at the Welsh Bridge, we followed the tree-lined towpath following the river as it winds its way along The Quarry, passing the ironwork Porthill Foot Bridge. 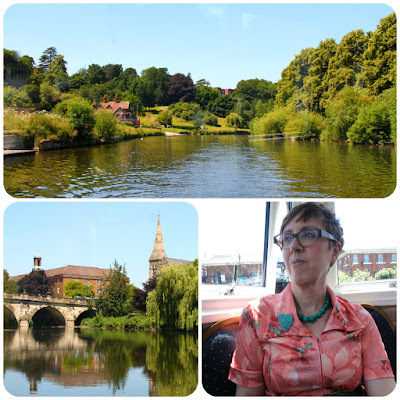 This connects the town centre and The Quarry with Porthill, providing easy access to the Boathouse pub on the other side of the river. The bridge vibrates significantly, even even when only a few people are crossing it, and I felt a quite dizzy just standing on it for a minute or so. Soon we made our way across The Quarry towards The Dingle, which lies at its heart. This is an enchanting sunken garden landscaped with alpine borders, bedding plants, shrubbery and water features, designed by the legendary Percy Thrower, who must have been the UK's first gardening celebrity. I left Jos sitting on a bench in the shade and went exploring, but the place, delightful as it was, was a heat trap and baking hot so, after doing a short circuit, we returned to the river's towpath. 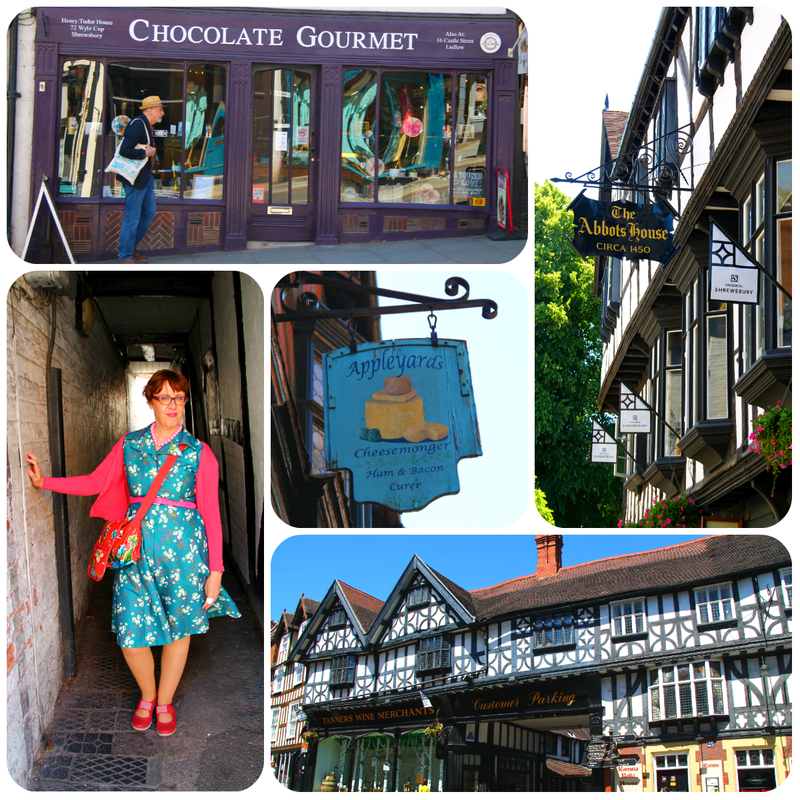 Shortly afterwards we turned left towards the town centre, meaning to explore the Town Walls Tower and Shrewsbury Cathedral, but by this time it was quite sweltering in the town's sun drenched streets, so any further sightseeing was cut short. Instead, we dived into a café for cakes and Cappuccino, before returning to the Park & Ride bus stop. To be continued, but in my next post I'm interrupting my travelogue for flea market adventures! Ah, I feel so relaxed, like I've gone on this journey with you! I really am enjoying your travel posts, Ann - you have a lovely talent with words. Laura's Tower is enchanting, and that boat ride looks wonderful. What a charming place! What a beautiful town! 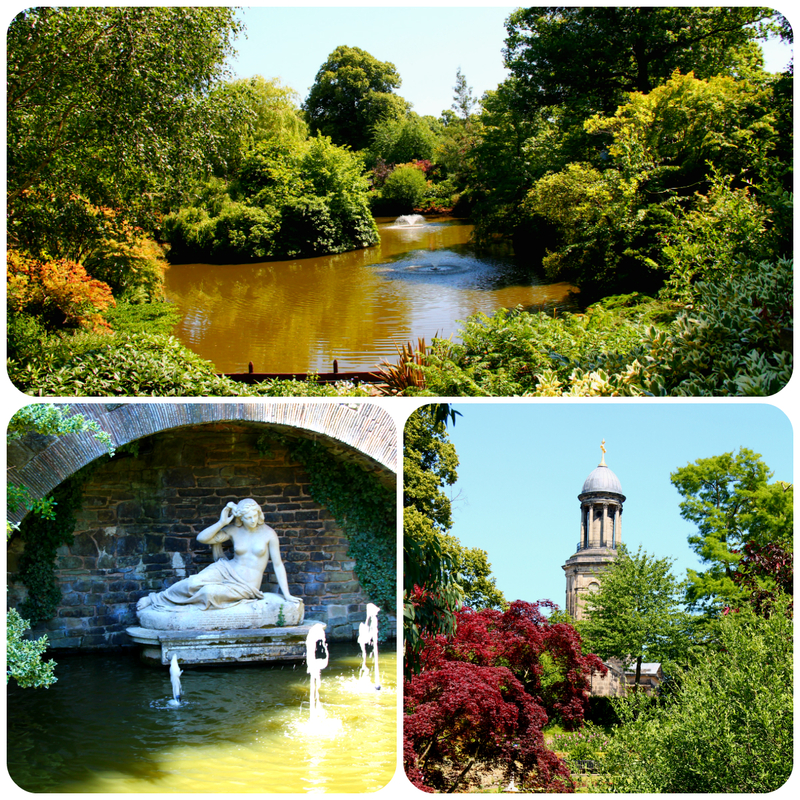 The gardens, the river, the churches! Ann, such beautiful photos. Love the tower and that carved ceiling. 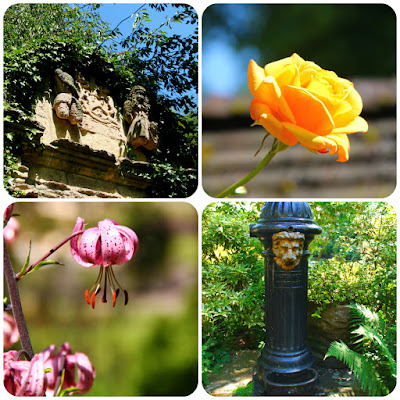 Enjoy reading about the town history as well. I had to look up salope to see what it meant and had quite a giggle! Ann I enjoyed traveling with you to this amazing village. So nice old houses, all looks so charming. Thank you for this wonderful trip! I love the UK. I love your dresses, you look colourful and lovely. 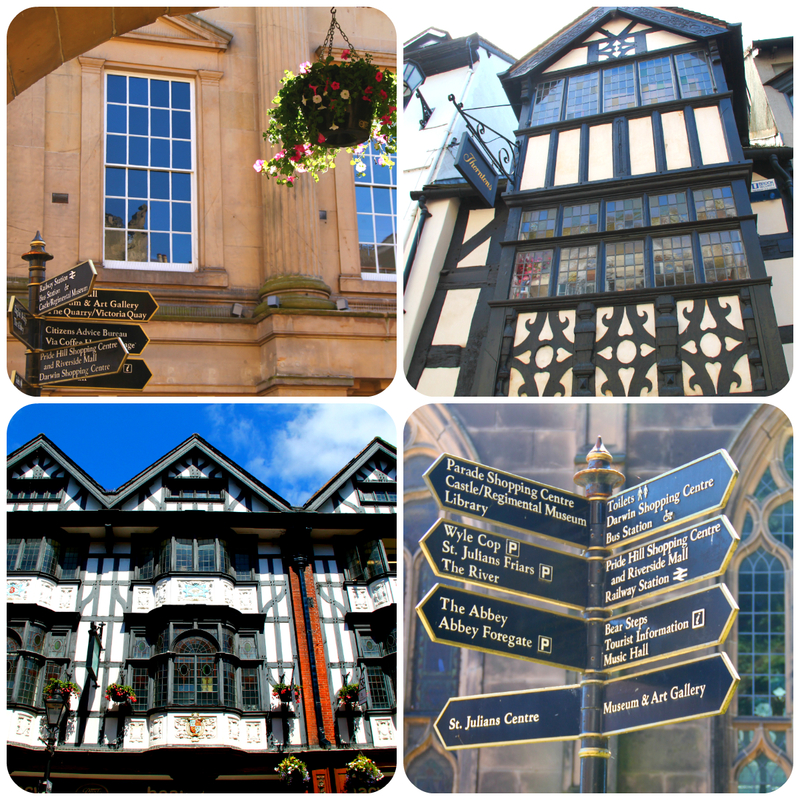 I've visited Shrewsbury only once and VERY briefly but you have made me really want to go again. It looks wonderful and you told me things I didn't know, I had no idea Charles Darwin was from there, and me a scientist!!☺. 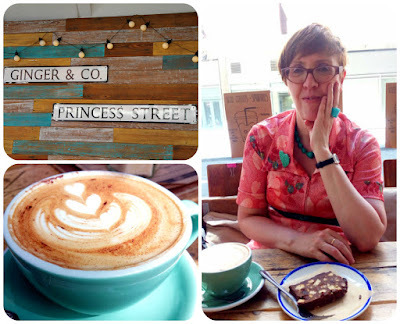 I like this kind of posts:isn't it fantastic how you can see the world through other bloggers' eyes?? Ha ha! Salope is the first thing I thought of too. Looks like a lovely day of exploring. oh - and jos in front of a chocolate shop!! 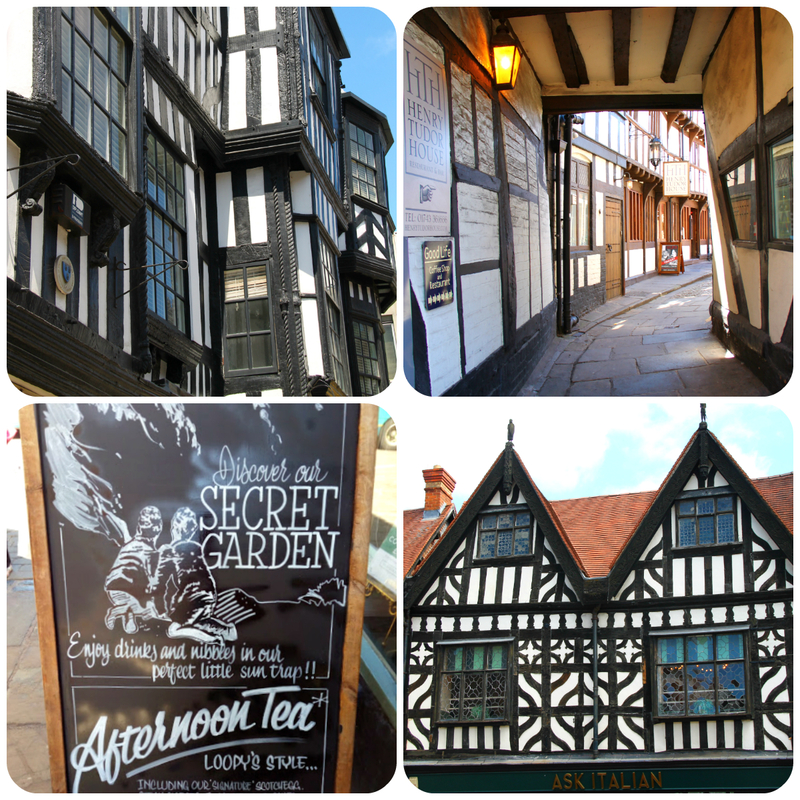 I don't think I've ever actually been to Shrewsbury, which seems to be a major oversight - it looks gorgeous! All those fabulous buildings! How annoying about getting those tenners changed, I don't see why you need to have an account to do so? Makes no sense! 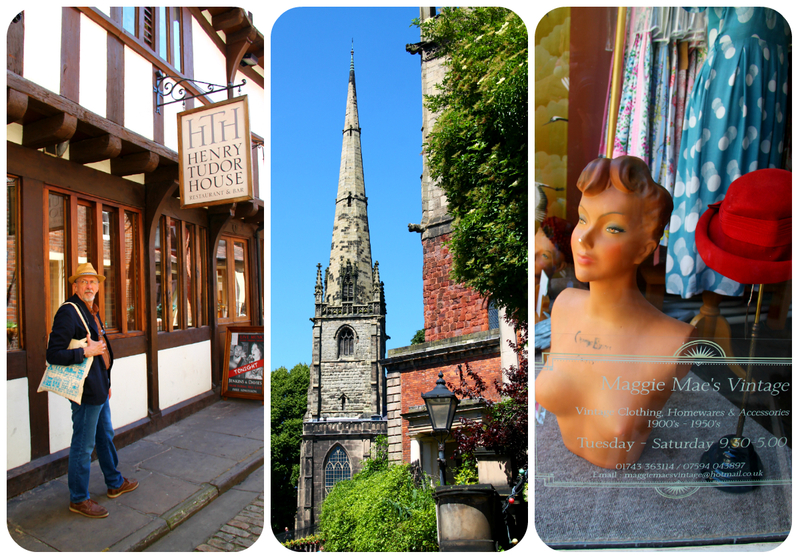 Shrewsbury looks fabulous in your photos, we haven't been in ages but it really is gorgeous - the charity shops are so expensive though! England tales are so enchanting when you tell them, Ann! 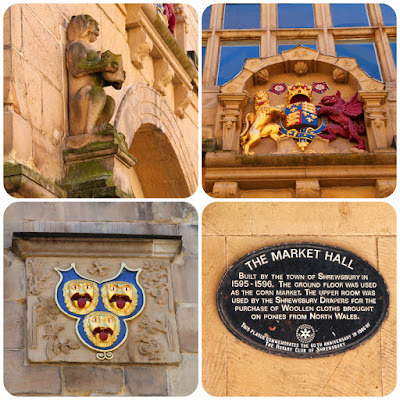 What a gorgeous town it is, and so tightly packed with history - castles, pretty towers, river, Darwin and Scrooge! oh my! You look utterly adorable on the steps of this tower, and that cake looks like something we make in Russia (basically a no-bake cake with nuts and chocolate). Lots of love, and always looking forward to more tales! Somewhere else on my list of places to visit! I recognised the Scrooge headstone instantly it's from my favourite film version with George C Scott.